Now we're continuing; where did the true church go? Where is it? And why is it, my friends, that we find people today coming up in what we believe is a Christian world, coming to believe as Christianity, things exactly opposite to that what you find in the Bible? Coming to believe things that are not the same gospel as the one that Jesus Christ taught. Practicing customs that we label Christian that were forbidden and were condemned by the early church, the church Jesus said He would build. The church He did build by the apostles. 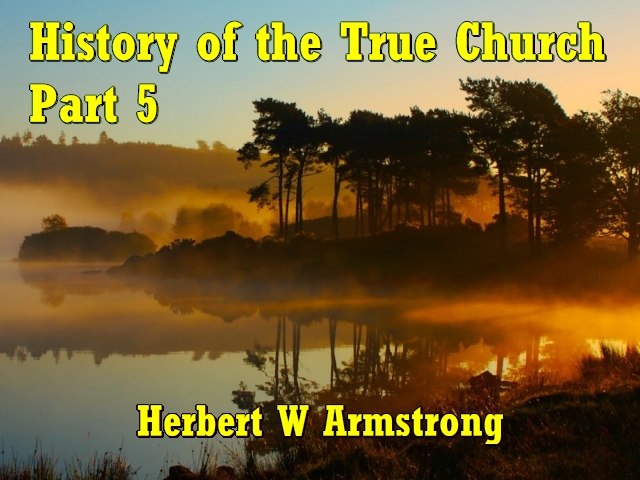 Now in looking into church history to see what did happen, and to see how the church, the visible church, the professing church, the church of this world, the church that became known and visible and great, how it got off the track and started the opposite direction, we've had to look for some things that most historians never looked for. They've never known what to look for. You have to know what is the true Church of God. And that church is the very body of Christ and it is the church that has, and is led by, the Holy Spirit of God. Those that have repented of their ways and of the ways of this world and have come out from this world and are separate. And that are living by every word of God that look on the Bible as authority. And who fear and tremble before its Word instead of saying, "Oh well, I don't think that makes any difference. I know the Bible says so and so, but then I don't see that it makes any difference, and here's the way I look at it." Now if there is anything that people do not like, if there is anything that goes against the grain of human nature, is to be criticized, it is to be corrected and reproved. We don't like to be criticized even where we are wrong. And even if we're right, we don't like it. But above all, people do not like to be corrected where they are wrong. It's the last thing that the normal man wants to do, to admit it where he is wrong. And that's why they wanted to continue with their pagan ways as they began coming into Christianity. Now we've shown you how the visible, politically organized Christianity got away from the truth and got away from the Word of God, got away from the gospel. But now we're tracing the real true Christian Church. Jesus said it would be persecuted. If they've persecuted Him He said they'd persecute His own disciples and His people. The prophesies of the Bible said this church would be scattered, that it would be despised by the world and that it would be a "little flock," small in number. Now we began tracing this church in history in the preceding program. And I've shown you that in the book of Revelation are two church groups, two religious bodies, both professing to be Christian, yet two altogether contrary and different bodies pictured. The one, the popular religious groups of this world, pictured in Revelation seventeen. And there under the symbol of a fallen woman, and woman is a symbol of a church, a great church, fallen, sitting upon many waters, ruling over many nations, speaking many different languages, and called by the name 'Babylon the Great.' Oh this is a great church. This isn't some little despised church you can't find and can't identify. This is a great one, 'Babylon the Great' (Revelation 17:7). But Babylon is confusion, and here is the mother of confusion. And the whole world is drunk, drunken on her false teachings, false doctrines. Now, spiritually drunk. You know what that means my friends. And the world is spiritually drunk. As a matter of fact most of us need to wake up and realize we've been born into such a world that we've come to believe in many of these things. Why do we believe what we do? How did you come to believe, my friends, what you believe? Why you've always heard them, you have accepted them, you've just swallowed these things hook, line and sinker because other people believe them. You know that's how you came to believe nearly everything you believe. That's how I came to believe what I believe, mostly. But you know, years ago God woke me up and He struck me down, in a different manner than the apostle Paul, but just as surely. And He brought me to my senses and caused me to begin check up on what I had come to so carelessly believe. And caused me to look into His Word and He opened my mind and my understanding to His truth. And I saw that what I had believed was wrong, and I had to repent, and I had to throw it out. And I had to acknowledge that I did not have the truth. And I want to tell you that there can be no true minister of God, no true minister of Jesus Christ who has not gone through that identical experience. Unless he has come to realize that he has been wrong, that he has been mistaught or has learned wrong things, that he has accepted and just assumed things that are not true, and has been willing to take the truth. And if I was going to accept the truth, I had to suffer the scorn of the very important people that I had known, and of relatives and of friends. That's the first thing anyone thinks of and they, most people fear people and they fear friends and relatives, they fear associates and club members and that sort of thing, so much. And it's so close to their eyes they can't see God and they don't fear God. Well I had to make the decision, and I made the decision finally that I was a little more afraid of what God thought than what people thought, and so I had to surrender to God's Word. And I had to begin to study it and I had to let it correct me and prove, until I found so many, many things that I had assumed and come to believe that most of us have come to believe in this world, were wrong. And to come to accept the truth. I don't preach the things I do to you because it was what I wanted to believe, what I grew up accepting carelessly. The things I preach to you are the very things that you will find recorded in your Bible, and the things that I've had come to accept the hard way. Because I have had to be made willing to repent and to put the precious Word of God above my ideas and above popular customs and what people think, and whether people will condemn me or not. Yes, there's a lot of good in human nature and there is also a lot of evil, and it seems the evil predominates. Well now, in the twelfth chapter of Revelation we find another church pictured, and that is the real church and it's a persecuted church. It's scattered, it's driven away. It's the church the devil is so angry with. And it's the church it says in the last verse, "...that keep the commandments of God, that obeys God, and they have the testimony of Jesus Christ" (Revelation 12:17 paraphrased), and the faith of Christ. Now we found that back in the second and the third chapters of the book of Revelation is the history of the True Church. This despised church. This church that would be small in number. The church that would be persecuted and driven away from organized society, even in order to survive and to live. As a matter of fact, my friends, there were millions of this church that were martyred. Your Bible says so, it's in prophecy, and whatever is prophesied is true. And the time for this prophecy is passed, therefore it has happened. And history records the fact that there were millions who gave up their lives for the very Word of God because they loved what the Bible says. You know today, even today, I can show many of you in my radio audience what the Bible says, and some, some people are going to say, "Well, Yes I know that's what the Bible says, but then I don't see where it makes any difference." Is that what you're going to say? Well that's your right and privilege. But I want to tell you there is a Judgment Day coming and you're going to stand before the very judgment bar of Christ. How are you going to answer then? You're going to be judged by this Word. Let me warn you, don't treat it carelessly. I've come to tremble before this Word, I hope you have. Alright. In the second and third chapters of Revelation you find the history of the church pictured under the seven literal churches that did exist on a mail route there in Asia Minor at that time. And the conditions pictured here are the conditions that did exist in those seven churches. But they were merely a type foreshadowing the condition that God, who knows the end from the beginning, knew would happen in the continuous history of His True Church, this despised, this persecuted church, this scattered church, small in number. The real church that Jesus did build, its history from that time until the Second Coming of Christ down in our day, and it's going to happen in our generation. Because it would be easier, you know, human nature likes to go contrary to God. The natural mind of man, which is human nature, as you read in Romans eight, the eighth chapter of Romans, "...the carnal mind [the natural mind] is enmity against God [that is it is antagonistic, it doesn't believe God's way and]: it is not subject to the law of God, neither indeed can be" (Romans 8:7). It always wants to go the other way. Just as a young man along from, oh eighteen to twenty-one or so, perhaps even a little younger with some men, they believe their father's all wrong. Their Dad doesn't know very much. And, and now I know at that age, even at age sixteen I knew a lot more than my Dad. I... my father didn't know very much at that age. I thought he did know something before that time and then I discovered that my father didn't know very much and I knew a lot more than he did. I've told you before how, then when I was twenty, I believe it was, that my folks moved away. Why we were living in Des Moines, Iowa and my folks moved out on the west coast and I didn't see them again until I was about thirty-three. And we came out to the west coast and I saw my father then for the first time in about twelve or thirteen years. And I've told you how amazed I was at how much my father had learned in that twelve or thirteen years, because now I found he knew more than I did! Well some of us grow up spiritually but most of us seem to think we know better than God, our Heavenly Father. We think we know more than He. And the natural mind is that way and it will turn away from the things of God if we don't overcome and control our own minds. Here's the church that was persecuted and living in tribulation. It wasn't a great popular church living in ease and luxury and popular in the world. Who is that? You know some people today are trying to tell you; some people that have an antisemitism in their minds, and who have hatred for the race of Jewish people, will try to tell you that today's race of Jewish people are the people here meant, and that they're not real Jews at all; that they are some foreign breed and that they're only pretending they are Jews. Now my friends, there is not a word of truth in that. I don't know why we have to have such bigotry and race hatreds and things of that sort. I want to tell you that people that have that are not Christian. The very first thing in Christianity above everything else, is having love in our hearts for other people. And I want to say to you, my friends, I don't care who you are and I don't care if this makes you angry. If you do not have love in your heart for the Jewish people, if you have hatred in your heart for the Jewish people today, you're not a Christian. I don't care how much you profess. Jesus Christ told us we have to learn to even love our own enemies. And I don't think you have a lot of Jews that are your enemies either. There are a lot of false accusations going around saying that the Jews control the world and they've got a stranglehold on all of us, and all that kind of poppycock! You know it's about time it's branded for what it is. Now I don't love the Jewish people any more or any less than I do other people, but I am not going to love them any less either. I just want to have love in my heart for all people, and I think you'd better join me and have the same thing. You know, I don't care how much faith you have, you can have enough faith to move mountains, and if you haven't got charity and love for people, you haven't got anything. Turn to I Corinthians the thirteenth chapter and read the first verse or two and you'll find it there and that's what God says and it's true. And it's going to judge you some day. Alright now, we're going to see who these people are that are the synagogue of Satan and say they are Jews and are not. Alright let's get into that now. Let's look at the history of this particular church at Smyrna. It is the one that arose next after the apostolic, original apostolic church. It was a church that suffered persecution and poverty, but it was a church that had works. Now today they try to tell us there aren't any works in the Christian church. Well there were works in this church and in every one of the true churches, Jesus said, "I know thy works" and there were works! And they were good works. But a little later He always had something wrong with them. Now that is one stage of the true Church of God as it was coming along in history. Alright, this pictures God's church during more than four centuries, more than four hundred years, under the persecution of the old, pagan Roman Empire in the days of Nero, and before and after of course too. Now beside the true church, there was also, as you read here, a synagogue of Satan developing in this period. That is a church of Satan, and Satan is the god of this world. And Satan masquerades as God and has palmed himself off as the true God, and has MILLIONS, yes MILLIONS of people believing that he is God, and turning the Word of God and the true Bible upside down. I want to tell you my friends, you need to look and see if you've been deceived by this thing. And I started to say a moment ago, that when a person is spiritually drunk, what does it mean? Well when a person is literally drunk on alcohol, you know what happens? When you get drunk your eyes don't see very well, you become, as they say, 'bleary eyed' and your eyes are all out of focus and things are all blurred. And they're so blurred you can't see them and you can't tell whether there's one or two or five things in front of you. Like the fellow that was found out late at night on a nice clear night, and he was counting. He'd get up to four or five and then he's start all over and get up to three, and he'd start again and get up to maybe six or seven and he'd start again. Someone said, "What in the world are you doing?" He told them to hush up and he said with a thick tongue, he was pretty drunk, he said "I'm counting the moon." You know he just couldn't see it very straight. And that's the way with things. Now when you're drunk you can't see physical things plainly, they're all blurred, they're out of focus. And when you are spiritually drunk, as the whole world is according to your Bible on these false teachings, I want to tell you that your spiritual perception is so blurred and so out of focus, you can't see the truth of God clearly and plainly. And even when you hear it so plain, so clear that a little child could understand, the people that are spiritually drunk just somehow can't see it. And those of us who have gotten our spiritual eyesight and cameras into nice sharp, clear focus, we just can't understand how it is that the truth, which is so plain, so clear, so simple a little child can understand it, and yet educated people and mature grown up people, they just don't get it. Well that's the answer, and that's the reason. Now let's get at this synagogue of Satan. What is this? Now synagogue is merely the Hebrew word for church. That's all, it's the Hebrew word for church. So then this is Satan's church. Satan palms himself off as the god of the world, he has his churches. And in second Corinthians the eleventh chapter you read he has his ministers and they pose as the ministers of Christ. They don't say, "I am a minister of Satan the devil." They say, "I am a minister of Jesus Christ." And he's had them, my friends, from that time way way back there centuries ago. It's no new thing, this is something that has been going on a long, long time and it's in your Bible and it's in history. Then Jesus, He's not speaking here of a race, He isn't speaking of a race of Jewish people, He's speaking about a church, the synagogue or church. And it's a church that belongs to the devil. It's in symbolic language in other words, and it's speaking of a church. Now this church claim that they are Jews. Now why do they claim they're Jews? Yes it was opened up to the Gentile too, but what about that? Now in Romans eleven, and if you will notice especially verses sixteen to twenty-seven, the apostle Paul explains that Israel, and the Jews, to "Whom salvation belonged" had been broken off. That is, individually, "All have sinned and have come short of the glory of God" (Romans 3:23). So that those that are Israelitish born, or born Jews, because they have sinned, have been cut off from their natural olive tree. And Israel there is pictured as an olive tree, and Gentile nations and Gentile races, as the wild olive trees. Now all the promises of God are to Israel and in this natural olive tree. That's where the olive oil is, not in the wild olive trees. But here they are, they are branches of that tree, each individual, and they have all been broken off because of unbelief, so there's no salvation just because they were born as Israelites, none whatsoever. And then they are pictured in Romans eleven, as being grafted as twigs or branches of a wild olive tree, Gentile, that are cut off from their Gentile citizenship and grafted, contrary to nature, into the Israel tree, the natural olive tree. Read that in Romans 11, verses 16 to 27. Alright, but once they're grafted in they are no longer Gentiles, because in Ephesians 2:11 the apostle Paul says that "...you [you Gentiles] being in time past Gentiles...." (Ephesians 2:11). Then in time past they were Gentiles but they're not any more. Now they are all one in Christ Jesus, and as he says in verse nineteen, Ephesians the second chapter. Now you see what he means by a church that is called Jews? "...he is a Jew which is one inwardly" (Romans 2:29). And all the promises were given to them, and even the Gentiles became spiritual Jews when they were in the true church. Now then, these people called themselves Jews but they were liars, they were not. They were of the synagogue — or the church — of Satan and not of the church of God. That's what he's speaking of there. And here was this Smyrna church and they hated those people that said that. They had separated themselves from this popular delusion and snare and error that was deceiving the world. So here was a church made up of Gentiles, claiming salvation, claiming to be Jews inwardly, masquerading itself as the Christian church, as the real church of God. But its god was Satan, and it was merely Satan's crowd, Satan's root, not God's church, it was the church of Satan, not the church of God. This synagogue of Satan simply is the political, religious, organized groups that developed immediately after the apostolic age. And that's the way God brands that. Now the world at this time did not recognize the true church, as you read in I John 3:1 "...the world knoweth us not..." (I John 3:1). And the world has never recognized the true church, so the historians, in trying to check the history of the church and find out what happened, they looked here at this church in Revelation two, of Ephesus and Smyrna, and Pergamos and Thyatira. And then in Revelation three, at Sardis and Philadelphia and Laodicea, and they tried to fit the visible, political organizations of this world — political religious organizations — they tried to fit them into this thing. Now it is from the organizations of this world that we still have to go to though for the scanty records of God's people who are now maligned as heretics. And you're going to find them branded as heretics, but when you find what they are branded for and what they believe, and when you find that they believe the same things Jesus did, the same things that are in the Bible, then you know they were the true church. And that's the way you have to find it in history. Now for centuries, worldly writers mentioned remnants of the true church within the bounds of the Roman Empire. And sometimes they were individuals, sometimes they were scattered families, and sometimes larger groups. And there were still a few local congregations preaching the real, true gospel, the same one that Jesus had preached and that the apostles had believed, and keeping the commandments of God, realizing God is the Supreme Ruler, and that we have to surrender to Him and repent, that's the first beginning of salvation. And they had that truth. Then as late as the beginning of the fifth century in Asia Minor, the Bishop Chrysostom bewailed members of the world's church, the popular church in the world, who, upon learning the truth from the scattered remnants of the true church, had repented of their ways, and had begun to observe the same things that Jesus had, the same things the apostles had, the original apostolic church. They began to observe, as you read in Bingham's Antiquities of the Christian Church, in book sixteen and chapter six. In this history, this authentic history, they began to observe the Feast of Trumpets, the Feast of Tabernacles, and the Feast of the Great Day of Expiation. That's where you read it. They got right back to the things that the world sneered at as Jewish. And the world had taken up pagan celebrations instead and branded the ways of Christ and the ways of the apostles as being Jewish. Well now, my friends, from the time of Constantine, along in the fourth century, the true church fled into the valleys and the mountains in Europe, and John the apostle, John describes this flight in the book of Revelation for over a thousand years. It's in the twelfth chapter in Revelation and I read it to you in one or two broadcasts back here, where he pictures the true church as a woman fleeing for her life from persecution. I'm going to give you the actual historic truth about that in the next program. And that they had not denied His faith, and what happened to them. And we're going to come right on down. I want to tell you my friends that the true church of God has existed in every generation from then until now. And we can trace the history and I'm going to give it to you in brief, of course. A compete history would take a whole book and it would take two years of these broadcasts to give it to you. But I'm going to give you the high spots of it and the whole history. I want to tell you that the real church of God has existed, and it's time we got our eyes open and search in the scriptures for the truth.